The Turnkey Interface (TKI) is just what it says - it comes fully assembled and tested ready to connect your telegraph loop into your computer. It's available for both USB and RS-232 computer ports and the USB version is now available in an oak replica WU junction box. 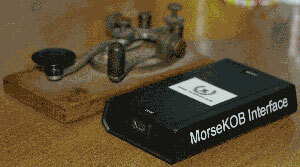 Orders can be taken for the Turnkey MorseKOB Interface as detailed on order page. Depending upon demand and inventory at the time you order, it could take a few weeks to build, test, and ship a unit. I am trying to keep a few completed units in stock so that I can get them out when ordered. Bare PCBs will be for sale if available, please contact me before ordering PCBs to check the availabiity - PCB pricing details on order page.